Clint Stennett, shown here in his Boise office, represented Blaine County in the Idaho Legislature for nearly 20 years. Former state Sen. Clint Stennett, an influential Democrat who represented Blaine County in the Legislature for nearly 20 years, died Thursday, Oct. 14, at his Ketchum home after a long battle with brain cancer. He was 54. Stennett was first diagnosed with cancer on Jan. 24, 2008, following an MRI that found three large tumors on his brain. Stennett underwent surgery on Jan. 29, following with chemotherapy and radiation treatments. Despite what was termed as a "serious health condition," Stennett returned to work at the Legislature just two weeks after the surgery and diagnosis. "I intend to be working and taking the treatments at the same time," Stennett told the Mountain Express in February 2008. "I'm coming out swinging. And I'm going to fight it as long as I have to." His cancer was deemed to be inactive in June 2009, but another small tumor was found in March 2010. The following three rounds of radiation treatment and brain swelling prompted Stennett's retirement from public service, and the trauma the treatment caused resulted in a seizure in mid-September that left him unable to talk or move without struggle. Stennett served as grand marshal for the 2010 Wagon Days parade in Ketchum just six weeks before his death. Stennett's death drew statements from many Idaho lawmakers this week, all of whom lauded him as a builder of bridges who was able to reach across party lines. "Clint Stennett knew how to build consensus on tough issues," said Idaho Rep. John Rusche (D-Lewiston). "If I am able to be half as effective as Clint, I would consider it a great success." 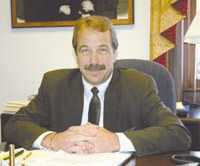 Stennett represented District 25 for 20 years, a district that comprises Blaine, Camas, Gooding and Lincoln counties. He was originally elected in 1990 as the representative for what was then called District 21, defeating Republican Tom Morrison. After serving two terms in the House of Representatives, he was elected to the Senate, where he served seven terms. Though he was known for forging compromise, Stennett didn't back down from confrontation, most notably in 2006 when he fought against a property tax cut that would have resulted in a rise of the Idaho sales tax. "This was a con job," Stennett told the Idaho Mountain Express in 2006, saying the governor at the time, current Sen. Jim Risch, was attempting to strong-arm the Legislature. Risch's bill cut property taxes but raised the state sales tax from 5 percent to 6 percent to make up the lost revenue. But even if they didn't agree with Stennett, his colleagues say, he still gained their respect. "It's certainly no justice," Republican Bruce Newcomb, former speaker of the Idaho House, told The Associated Press. "The good die young." In 2007, when Ketchum was threatened with the ever-spreading Castle Rock Fire, it was Stennett who brought in much-needed resources to the region. Blaine County Commissioner Tom Bowman credits him with having made incredibly helpful, even "game-changing" decisions to help the area during the fire. Stennett's dedication to public service was demonstrated in his prompt return to the Legislature after his initial surgery for brain cancer. In a March 2008 interview, Stennett said his return to the Senate meant a return to normalcy for him. "It gives you a reason to get up every day," he said of his Senate seat. "I just had a burning desire to get back. That's what keeps me coming back—giving back, a desire for public service." Though he was re-elected later that year, running unopposed, Stennett was unable to travel to Boise during the 2009 or 2010 legislative sessions due to the effects of his treatment. The new round of chemotherapy and radiation treatments left him too exhausted. Former Sun Valley Mayor Jon Thorson filled in for him during the 2009 session. When Stennett was unable to return to the Legislature in 2010, Stennett's wife, Michelle, stepped in as his temporary replacement. She is currently running to retain the seat. "We've both been of the opinion of giving back," Michelle said of her and Stennett's dedication to public service in an August interview. "You participate. You're not just a stakeholder." Michelle said Stennett gave her advice on how to handle the Legislature before she filled in for him, advice that sheds light on Stennett's political approach. "You just have to look into your heart, think with your gut and tap into your conscience," she said he told her, advice which is supported by Stennett's focus on voting with his conscience rather than along party lines. District 25 state Rep. Wendy Jaquet, D-Ketchum, said that if Stennett had not gotten sick, he may have gone even further in the political realm. "I was always telling him he should run for governor and I would be his Rosemary Woods," Jaquet said. She said Stennett considered running for governor, and may have launched a campaign in 2016. The current governor, though he didn't tend to be politically aligned with Stennett, still expressed his respect for the senator. "Clint was a model of civility and bipartisan cooperation," Gov. Butch Otter said. Before he was a politician, Stennett was a media mogul in the Wood River Valley. Born in Minnesota, Stennett grew up in the Magic Valley and attended Wood River High School. He graduated in 1973 and attended College of Southern Idaho for a year and a half before earning a journalism and advertising degree from Idaho State University. He owned and operated media outlets in the valley for most of his business career. At the age of 28, Stennett invested in the Hailey-based Wood River Journal. His share of the investment was $6,000, an amount Stennett said was his entire net worth at the time. After buying out his partners, he sold the paper in 1987. He purchased the KSVT television station the same year, and also owned and operated radio station KSKI, which he owned for about five years. Above all, friends and colleagues say, Stennett was truly dedicated to the people and the state of Idaho. "He just loved everything about Idaho," Jaquet said. "You know how people talk about a Renaissance man? He was a true Idahoan." Stennett will be buried in a private family service in Twin Falls next Saturday. The governor has ordered flags at all state buildings to be set at half-mast on that day. Kathryn Goldman, campaign manager for Michelle, said a public celebration of Stennett's life will be held in November, as soon as a large enough venue can be found. Details will be printed at a later date.